Following a six-figure sum investment in research and development, the new hybrid TRACKROV system has been mobilized to carry out unexploded ordnance identification (UXO) surveys for a major renewables project in The Netherlands. Aberdeenshire-based ROV and tooling engineering firm Aleron Subsea said its new TRACKROV technology has secured its first contract win to support unexploded clearance work for a wind farm route clearance project in the region. 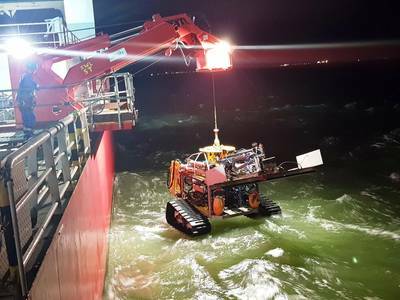 The high-tech TRACKROV vehicle has been built to operate on the seabed for extended periods and in currents of up to three knots. By designing it as a heavy flotation free system, it can stay in the water longer than work-class ROVs typically utilized for these seabed survey campaigns, the manufacturer said. The vehicle can be deployed from a small ROV A-Frame or vessel crane and is fitted with the Pangeo Subsea Sub Bottom Imaging (SBI) system, a high flow dredge pump and a series of survey sensors to locate and identify potential UXO targets. Aleron Subsea technical director, Mike Bisset, said, “TRACKROV was designed to support multiple tasks for clients who require seabed operations completed around the world in regions known for their challenging tide and current conditions. It was a complex task but one we have met head on thanks to the engineering skills of our in-house team and their experience in supporting other similar projects in the renewables and oil and gas arenas. 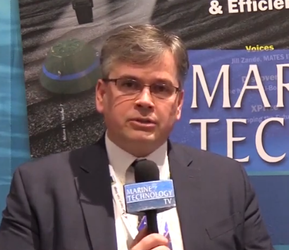 TRACKROV is the latest remotely operated technology to be designed and built by the firm. The company also has work class ROVs in its portfolio as well as its AUXROV vehicle which is designed to support boulder clearance projects in the wind farm market. Aleron Subsea also provides ROV tooling through its sister division, ROVQUIP.